A new place for peaceful reflection // Shortly after the construction of Armstrong Browning Library in 1951, Dr. A.J. Armstrong, longtime chair of the Baylor English department, wrote in a letter, "(A)fter dedicating the Library in a blaze of glory, we (realized) we had practically not a penny left for landscaping." In that letter, Armstrong envisioned "an outstandingly lovely portion planned for the grounds" to include beautifully designed benches where people can sit and meditate and absorb the beauty of the garden. 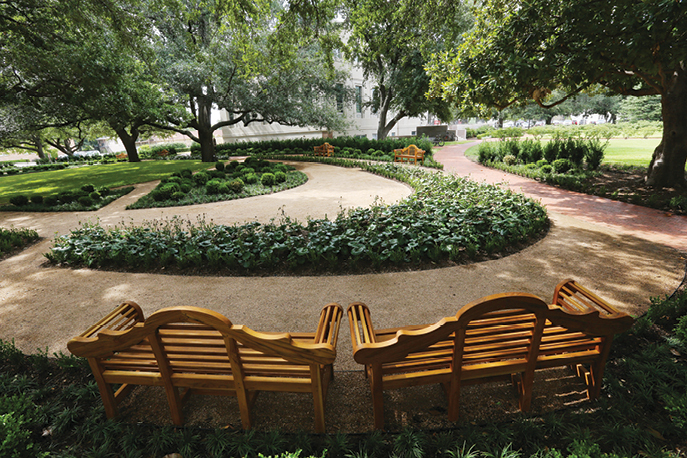 On Sept. 14, thanks in large part to generous lead gifts from Sue Getterman, BA '50, of Waco and Waldo, BBA '49, and Minnie Lee Hill, BA '47, of Houston, the university dedicated the Armstrong Browning Library's 'Garden of Contentment,' bringing Armstrong's vision, formed six decades ago, to life. Throughout Texas and across the nation, items branded with Baylor's official green and gold are red-hot sellers, and demand for Baylor- branded merchandise is at an all-time high. Renowned constitutional scholar joins President Ken Starr for Constitution Day "On Topic"